I got bored the other night, and since I am sick... and I can't do much... I decided to play with some images. My friend saw it and want me to print it out for her new house. #1 - people come first - you say you are unwell - get well soon - best wishes from us both. #2 - when I saw the central shot of this I said "WOW" out loud - the B&W is spot on with exposure, composition and clarity - it kinda has a Old India feel to it and deserves to be printed BIG. Take care over there, if you need anyone to come over a put "Vic Vapour Rub" (assuming you have a cold or something!!) on your chest - I'm your man!! Thanks John, for the out loud WOW. I wanted to put together a compilation, that is why I used the grapes on either side... The porch is from the vineyard where the grapes were grown. 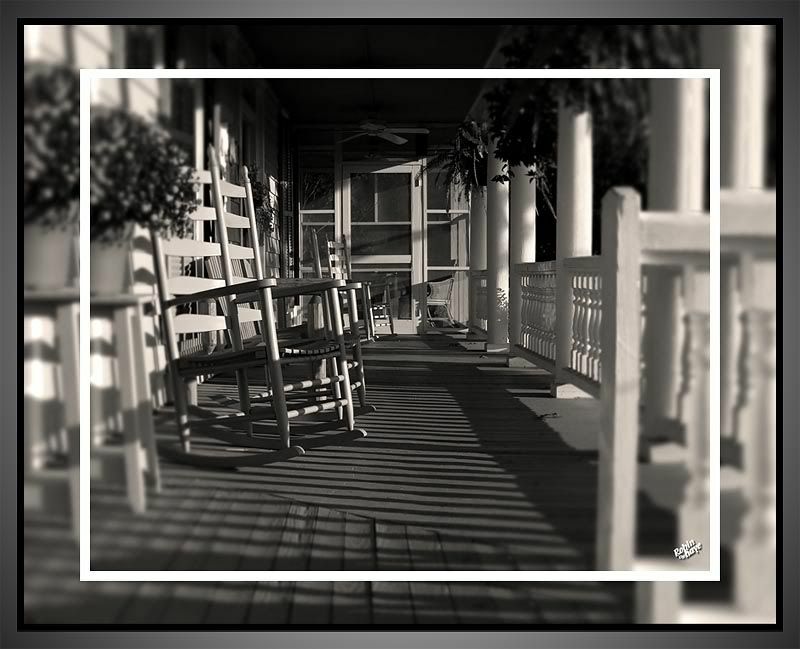 I have printed and framed the porch by itself, but this was for my desktop... then my friend saw it and wanted one printed for her house... I have been playing with the different framing and colors of the grapes. So I wanted some opinions from people who have not been looking at it for 5 days. Should I try blending the grapes b&w to a sepia. Or offer to print the three images separately and them have them framed together? This one I made the grapes more sepia to match the center. Robin - for me just the porch - but in any aspect of art (and I include photography in that statement) it's what you perfer. Many will like or dislike as you know. To me the porch is an awesome shot worthy of the space on it's own. 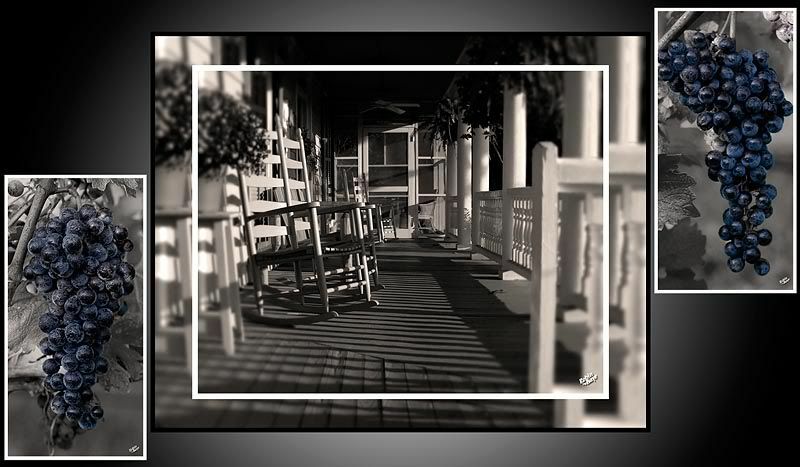 No blending of the grapes in B&W or Sepia............ just the porch. But thats MY choice - others may rightfully see otherwise. I like the pic of the porch on its own too. I do like the colour of the grapes as well, and no, I wouldn't change that to sepia. If the grapes are to be part of the overall image then I think they would look better being the same height as the central porch image (which is simply wonderful Robin) to create a Triptych with each image in its own frame. Are the grapes used in wine? Maybe add a bottle if it is. Yes the grapes are used in wine.... I will have to get a bottle and try that. I also like the porch on it's own Robin, I like it with the grapes too, the second more sepia color background. I would put both the grapes at the same height (top). Maybe a wine glass either side at the bottom. Just a suggestion, sometimes when you look too long you lose track. Subject: Re: Trying something new?